As Melbourne’s leading guitar ensemble, Melbourne Guitar Quartet’s (MGQ’s) blend of innovative arrangements, technical flair and superb ensemble playing place it as a brilliant addition to Australia’s musical landscape. Through MGQ’s unique guitar family instrumentation of classical bass, baritone, standard, treble and octave guitars, it has worked tirelessly towards establishing itself as a guitar quartet unlike any other with self-penned re-workings of established classics and a passion for newly commissioned works. MGQ embodies a vibrant and dynamic onstage musical persona that has amassed diverse audience appeal since their formation in 2005, captivating avid lovers of chamber music and guitar aficionados alike, as well as leaving concert first-timers fascinated by its unique musical approach. With MGQ at the helm, guitar performance is set to be transformed as the four guitarists continue to explore the world of their instrument as you have never heard or seen before. Celebrating the guitar through spirited melodies with intoxicating rhythms, Melbourne Guitar Quartet travels deep into Brazil and the Americas. 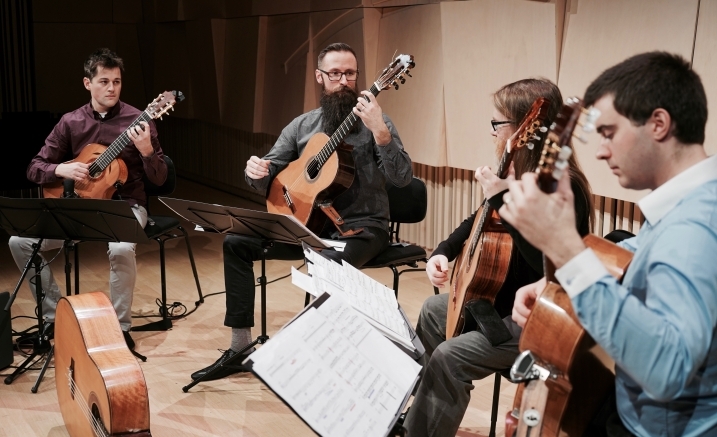 Energetic and enchanting guitar music includes the Quartet’s original arrangements of selections from Heitor Villa-Lobos’ String Quartet No.5, and the extremes of rapture and melancholia come to life in contrasting works of Egberto Gismonti and Chrystian Dozza. The Melbourne Guitar Quartet (MGQ) is dedicated to the development of new chamber music repertoire for the instrument. MGQ uses the guitar family of instruments (classical bass, baritone, standard, treble and octave guitars) producing a rich and broad timbral spectrum for guitar ensemble performance. Purchase the Melbourne Guitar Quartet three-concert package and save!